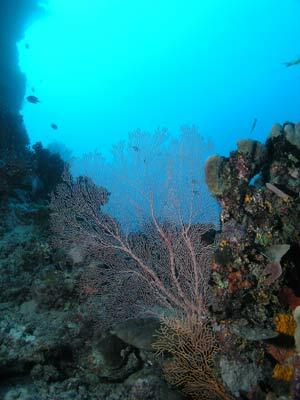 This dive is a drift dive along the northern side of Ribbon Reef Number 2. At this location there is a quite large entrance to the inside of the Great Barrier Reef. This is between Ribbon Reef Number 2 (to the south) and Ribbon Reef Number 3 (to the north). The dive starts at about GPS Reading S15° 32' 01.1" E145° 48' 05.3" using WGS84 as datum. It is 111 kilometres from Port Douglas. 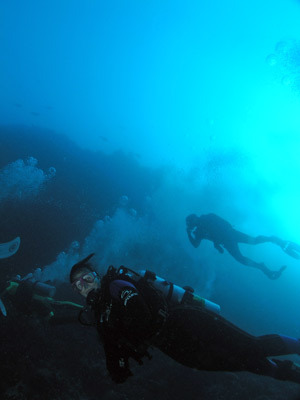 The dive ends near a mooring located about 400 metres to the east. It is done on an outgoing tide, although there is no reason you could not do it in the opposite direction on an incoming tide. Here you drop into the water off the main southern reef (the very north end of Ribbon Reef Number 2). The reef is composed of a vertical wall that drops to about 35 metres. This wall is brilliant, with more gorgonias than I have seen anywhere on the Great Barrier Reef. There are small ones and medium ones and even some large ones (almost two metres across). You should be able to get some great photos as you drift along. Look ahead and when you see a nice gorgonia, speed up and turn around and get a shot of your buddy as they approach it. There are also quite a few groups of red sea whips as well as solitary large whips. Off the wall you will see white-tipped reef sharks, numerous unicornfish, some barracudas and even some pelagics. 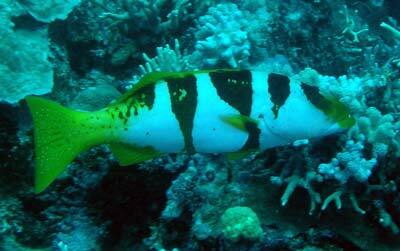 You may also see a very large turtle, nudibranchs and titan triggerfish. After about 20 minutes on a slight current, the depth at the bottom of the wall comes up quite steeply from 35 to 20 metres. The wall here turns a little south and creates a sort of bowl. There are a few small bommies in this area. Keep heading east and you will soon come to the main wall again. After a few minutes the bottom drops off again to about 30 metres (or more) and wall becomes prominent like before the bowl. There are less gorgonias on this section but it is still very interesting. After about 30 minutes you will see some cracks and gullies that run back into the reef. These may be interesting but I did not examine any of them. One thing I did notice was that these gulllies had water flowing from up higher down to the deeper sections. This is presumably the water running out from the reef top. It was much warmer and dirtier than the normal water. A couple of them are quite large, with large "landslides" of sand seemingly flowing out of them to the sea bottom. The main reef starts again a bit further on. By the time you get here it will be about 40 minutes and this is probably a good place to end the dive. There are a couple of shallower sections that come up to nearly five metres. Spend the next 10 or 15 minutes in the 10 to 12 metre range with five minutes at five metres to finish. You will be just east of a mooring owned by Undersea Explorer. 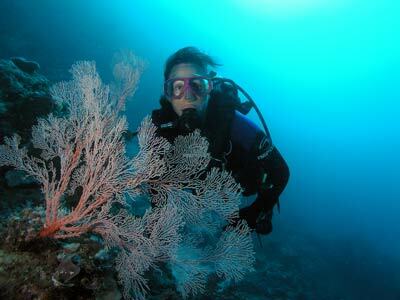 This is an excellent dive, one of the best I did on the Great Barrier Reef. Visibility was at least 30 metres on an outgoing tide, there were stacks of large gorgonias and heaps of fishlife to keep everyone interested. Well worth doing.